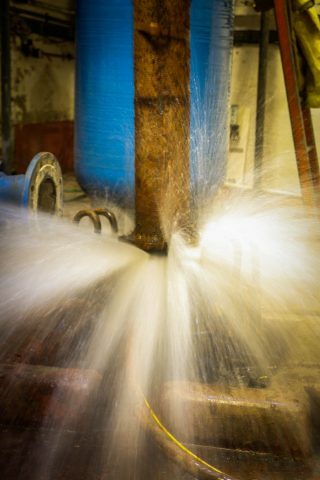 Ageing borehole undergoes operation at St Hellier Hospital. St Helier has a rich history, starting in 1938 when Queen Mary laid the first foundation stone at the site. This year it celebrates its 75th Year. The first patients were admitted in 1941 and the building was completed in 1942. The cost of the rent at the time was just £1 a year. Sadly, less than a month after completion, the hospital was damaged by a bomb dropped during an air raid in World War Two. Further damage was caused throughout the war, and the hospital was struck by two flying bombs in June 1944. However, St Helier remained open and continued to grow after the War. The whole hospital was eventually camouflaged to prevent the Luftwaffe using the hospital as a landmark for sighting runs into central London or being targeted following aborted air-raids over the capital. When finally completed, St Helier was one of the first buildings in the United Kingdom to have underfloor heating throughout the main structure and patient areas and was used as a template for further hospital buildings due to its success. 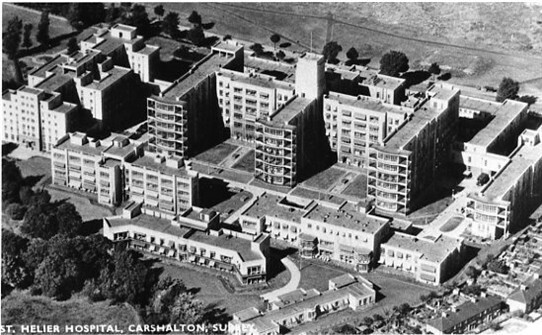 During the 1960s and 1970s, the hospital was extensively underpinned due to excessive subsidence due to the topography and structure of the surrounding land and the naturally high water table of Carshalton. The works were completed by Cementations Ltd and the work on the hospital became a textbook entry for the industry. In 1974, St Helier Hospital accommodated the first kidney transplant: a 24-year-old man had an operation at the hospital where he received a kidney from his sister. In 1977, the A&E department was opened for the first time following an investment of £200,000. St Helier Hospital has also played host to royalty in the past. During the hospital’s Jubilee year in 1963, the Queen Mother visited the hospital to give nursing awards to staff. In 1987, the Princess of Wales officially opened the new maternity unit. The borehole at St Hellier dates back to 1939 when the hospital was under construction and has been used to extract large quantities of water from the aquifer using the pump affixed to the well-head pipework. The original well was excavated to a depth of precisely 1,257’-00” (or 383 metres) through no fewer than 21 different layers of soil, rock, sand and clay. 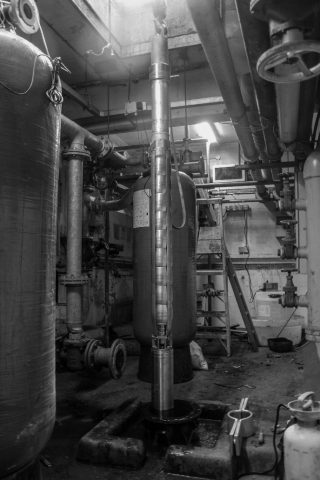 The water from the borehole was discharged into anti-stagnation tanks in the central boiler house and was then pumped back up to the cold water down service tanks at the very top of the hospital in the storage tank room 130 feet up. The original four tanks were capable of holding around 70,000 gallons of well water. The original abstraction licence from the borehole was rate in excess of 30 million gallons per annum. In 1977 a Grundfos submersible pump was fitted. The original design parameters of the pump were listed as 20HP and had a delivery rate of 140 G.P.M against 250 ft. head. 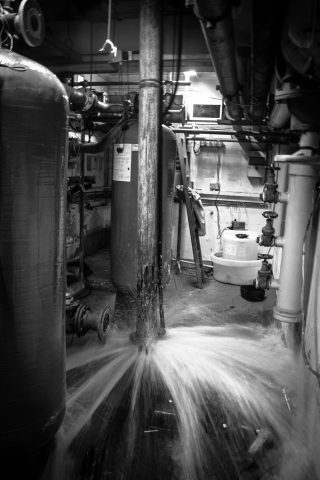 Tests on the pump electrical supply proved that the motor windings and supply cable were starting to degrade and the unit occasionally would trip out meaning that the hospital had to run on mains water backup. This was extremely costly as the hospital currently consumes at least 200 tonnes or 43,994 gallons of water per day, costing in excess of £600 per day. 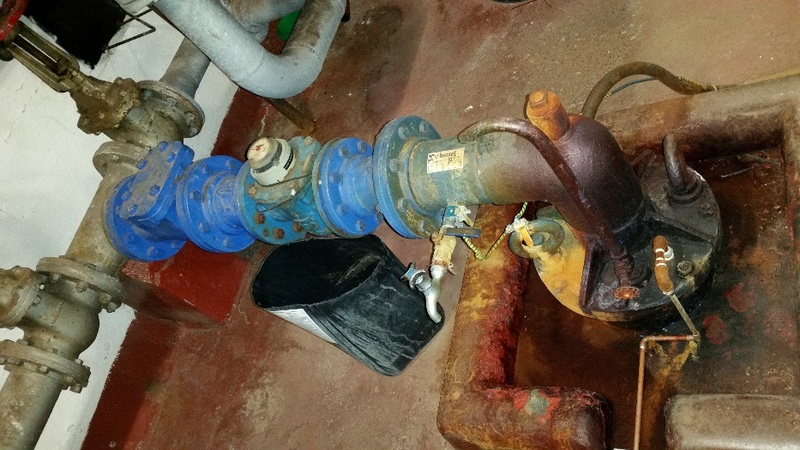 When the pump started to fail the hospital contacted Borehole Engineering Services to carry out some well needed maintenance. The works involved removing the pump and riser and replacing with a new one and then upgrading the headworks. From the initial site visit BES established that the borehole was artesian, meaning that when the pump was removed the water would overflow the headworks. This was accurately calculated in 1977 at a flow rate of 7,000 gallons per hour under high water level conditions! The new stainless steel head-plate and ZSM rising main were designed to assist easy insertion and retraction into the bore and reduce the amount of ferrous steel present in the well itself. Recently high levels of iron concentrations had been causing issues in the borehole. 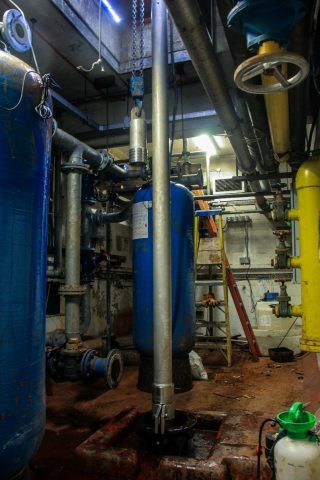 The new Grundfos SP46-9 MS6000 15kW motor and pump unit were chosen to deliver the required high velocity flow needed to the hospital distribution network and is now sited 196 feet or 60 metres down the borehole and is working flawlessly. The quick-release couplings on the sections of riser mean that future maintenance will be much easier, drastically reducing the time necessary to remove and disassemble the pipework. 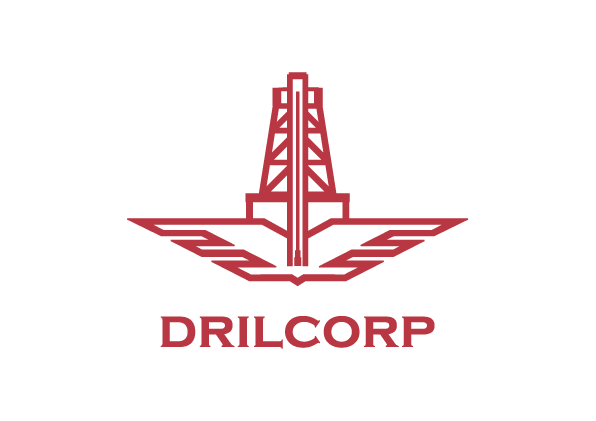 Drilcorp have worked with Grundfos for over 10 years. More information on Grundfos can be found on our website.